The Skelmanthorpe Band were delighted to work with Lloyds Band on Tuesday 12th November to play a programme of Yorkshire music. 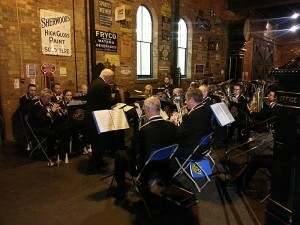 The event, held at York Railway Museum, was to promote business in Yorkshire and over 300 representatives were present from a wide range of companies. Once again our thanks go to Les Beevers for conducting and preparing the band as well as percussionist Richard ‘Jesus’ Hartnell who wrote a special piece for the event entitled ‘I predict a ruby’ celebrating the music of Leeds band the Kaiser Chiefs.